This year was the 100th anniversary of the opening of Wrigley Field, Chicago’s little baseball wonderland nestled in the middle of a true neighborhood and much heralded both for its authentic, old-time baseball feel, as well as the extraordinary amount of …um…losing… that has happened there. In 2008, just one month after I had kicked off my “visit all of the ballparks” mission, my then-girlfriend-now-wife Jen surprised me with a trip to Chicago to see the Cubs play at Wrigley Field. Not only had she gotten the location, she had also (1) purchased bleacher seats (I had said I wanted to experience the park in the bleachers with the ‘bums’), (2) against their rivals the St. Louis Cardinals, and (3) in a pennant winning year, no less! This was a home run of a surprise, no pun intended. So in September of 2008, we loaded up the car and drove to Chicago to take in some baseball. For those who don’t know, Wrigley Stadium is in the middle of a real Chicago neighborhood (Wrigleyville), so one of the first things to know is that parking is extremely hard to find and at a premium. Luckily, the ever prepared Jen was aware of this, and had not only gotten us a hotel a distance away, but plotted out the train lines so that we could get there bright and early. Which we did – wise decision, as it turns out people line up EARLY for the bleachers and day games. We joined a line full of reveling Cubs fans, and I don’t think it’s going to shock that many of them had begun the day’s drinking well before they got there. It was a party atmosphere and, when they finally opened the gates and we came pouring in, it stayed that way. Immediately, Wrigley Field transports you into a different time (Fenway does this even more so, a point for another post). It feels incredibly small and comfy, and not overwhelming like many modern stadiums do. Most importantly, a sense of history just seems to seem out of every crack and crevise. The feeling that it’s bigger – bigger than you and me – and smaller at the same time. It’s just a game, just a sporting event. Grown men running around a grassy field. But it has meant so much to so many. 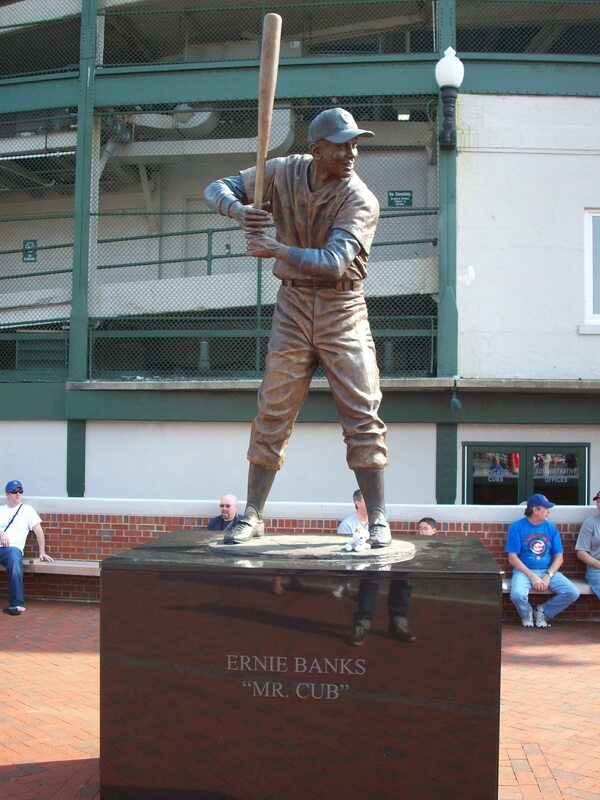 I know I’m sounding like Terence Mann, James Earl Jones’ character from Field of Dreams, but as hokey as it seems, Wrigley makes you feel this way. There really is something to be said for standing in the same place to get a beer and hot dog where generations of fans have done the same thing. That said, one of the first things you’ll notice is a small group of vendors and concessionaires than you are used to. It’s not that there aren’t plenty, but the concourse doesn’t seem like a shopping mall, like it does in most stadiums. We made our way to our seats, and stopped for the right food and drink for the experience: Chicago style dogs and Old Style beer. Wrigley has it’s share of specialty foods now, and micro-brews, but we were going for the fully authentic experience. Dogs and suds in hand, we wandered down to our seats. Now, plenty has been said about the Bleacher Bum’s rowdiness and sometime lac of manners, but we did not experience any of that this day. The people around us were pleasant and cheerful, and pretty damn knowledgeable about their baseball! Not many other stadiums in America have their outfields fill up an hour before game time, but this one does. The temperature was just right – mid 70s – and there was a slight haze over the field. We watched the prep and marveled on the famous outfield ivy and the magnificent old scoreboard. While I admit, the Chicago dog was not my cup of tea, my wife still swears that it was the best dog she ever had. The game itself was a bit of a sleeper. The Cubs clinched their division the night before, so they put in their “B” lineup this day. To be honest, I only knew a couple players on the Cubs roster that day (Kosuke Fukudome, Ryan Dempster), and the Cardinals roster wasn’t much better, although they had left in Albert Pujols. But it didn’t matter. For nine innings (that only took 2 1/2 hours), we soaked in the sun (it ended up reaching the mid-80s), enjoyed some of baseball’s best fans and ate a few too many Chicago Dogs. Below are my stats. I’ll post them for every park I’ve visited. I include the big details, as well as who I visited with. Lastly, I am a huge fan of throwback jerseys, and for every stadium I visit, I buy one of a player from that organization I admired as a kid, from watching them or reading about them. So for every one, I will also list the throwbacks I’ve added to my collection for each. This week’s bourbon and circumstances are pretty special. I am in Chicago to celebrate my first wedding anniversary to my wife Jen. We’re here for a long weekend, and living it up – hotel in the loop, meals at great restaurants like Everest and the Signature Room. Perhaps most fantastic, we’ve gone to two days of Riot Fest, an outdoor music festival at Chicago’s Humboldt Park featuring some of my all-time favorite bands, including (most importantly), the first American concert by The Replacements since 1991. On Friday, we went to US Cellular Field and saw a White Sox-Indians game, which I will detail further in the future. Then, it was to Everest, where I knew we were going to have a wonderful meal when the drink list included my all-time favorite bourbon, Jefferson Reserve 18 Year. Saturday, it was all day at Riot Fest, where we took in Mephiskaphales, X, The Selecter, Dinosaur Jr, Guided By Voices, Blondie, Rancid and The Violent Femmes. Set after set, we had a fantastic time on a uncloudy, beautiful day. Jen was particularly fond of DeVotchka, a great gypsy-latin-eastern-european band that put on a particularly wonderful performance. It’s not everyday you get to see the hora danced at a punk rock festival! We closed the night on a Ferris Wheel, watching the Femmes perform their first album in it’s entirety. It was a wonderful day. Day three was wet. Wet and rainy. 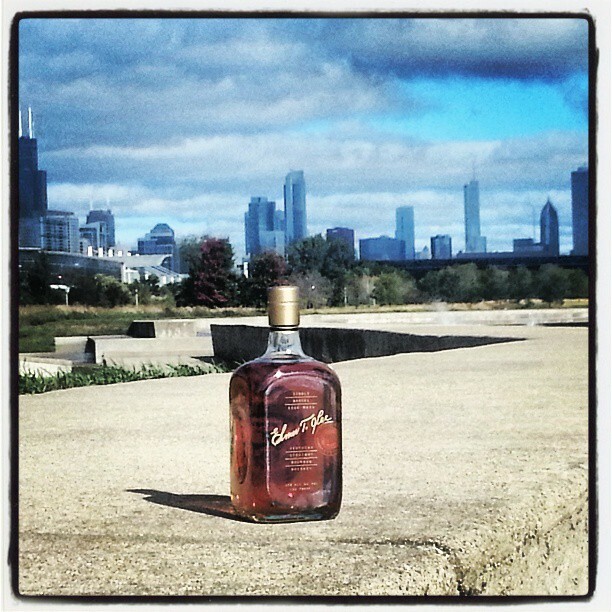 We had a delicious brunch at the Signature Room, then we headed to Warehouse Liquors, which Yelp had advised us was one of the best bourbon shops in Chicago. Yelp told no lies – this store is truly fantastic. Their selection of liquors – not just bourbons – was amazing, and with so many new sights and bottles to choose from, it was hard to pick one. After chatting with the man at the counter for at least one half hour, we settled on a bottle of Elmer T. Lee Single Barrel, selected by and bottled for the store. Back to Riot Fest, and the rain. Bob Mould has been one of my favorite musicians for many many years – since his days in Husker Du and Sugar – so it was well worth getting a little wet to see a personal legend play. Best Coast was another new band I wanted to see and despite the cold and rain, they did not disappoint with their reverb drenched surfer songs. Then, back to a rollicking set by Rocket From The Crypt. We decided to stay at the Replacements stage to guarantee a good vantage point, so we watched the goth-punky AFI before the rain stopped, and The Replacements utterly rocked our world. They played a set drawn from their whole repertoire, old to new. So many of my favorites were played I couldn’t have been more pleased, from “Bastards of Young” to “Achin To Be,” “Hold My Life,” and “Takin A Ride.” And all of it with my beautiful wife by my side. It couldn’t have been better. Now, for the bourbon – the nose on this bourbon is full of rich, aromatic spices. Cinnamon, allspice, apples, it has it all. The taste follows this with a spicy punch. Tasty, and clean, this is a great bourbon. Pepper, oak char, that cinnamon, and a bit of vanilla helps with a long finish to boot. This is the kind of bourbon my wife particularly likes. We did notice one unique thing though, neither of us liked the changes adding ice chips made to it. Instead of mellowing it a bit, it made the pepper pop more, and lost some of the sweeter notes. Still, an absolute winner. The Replacements at Riot Fest!! !